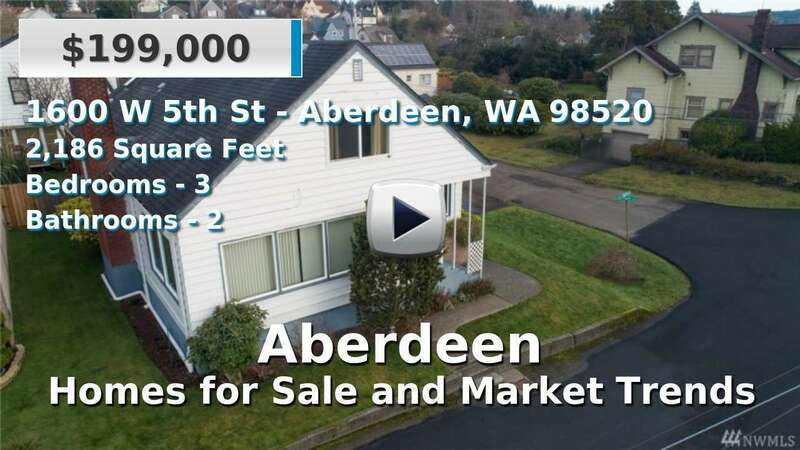 Aberdeen is the largest city in Grays Harbor County with 17,000 residents, boasting a variety of homes for sale from an eclectic range of styles; rural homesteads on acreage, city street Victorians and waterfront Contemporaries just to name a few. Aberdeen is located in northwestern Washington at the start of the Olympic Peninsula, and is often called the “gateway” to the peninsula. The city is situated at the convergence of the Chehalis and Wishkah Rivers, where the Chehalis meets the Pacific Ocean. In recent years, Aberdeen has become an important retail and tourism location in the state, but it remains dependent on the logging and fishing industries as it has for decades. There are also a lot of building opportunities in Aberdeen with plenty of vacant land parcels to choose from. 4 Beds | 1.75 Baths | 2503 sq. Ft.
3 Beds | 1 Baths | 1264 sq. Ft.
2 Beds | 1 Baths | 1267 sq. Ft.
3 Beds | 2 Baths | 1696 sq. Ft.
3 Beds | 2 Baths | 1768 sq. Ft.
3 Beds | 1.5 Baths | 1170 sq. Ft.
3 Beds | 1.75 Baths | 1750 sq. Ft.
3 Beds | 1 Baths | 1439 sq. Ft.
5 Beds | 2.25 Baths | 2580 sq. Ft.
2 Beds | 1 Baths | 1719 sq. Ft.
4 Beds | 3.5 Baths | 3215 sq. Ft.